to drive its hardware and how I implemented it in two demo screens. from the following register is added instead. allow operations  for any rectangular bitmap area. Same as Source  X but this one  is applied to the destination address. Same as Source Y Increment but it's applied to the destination address. idea to use adjacent colours for that reason. the last one looking like the colour palette of the Atari logo from TOS 1.62.
from the additional word ammount. everything  but  zero  to  keep a  constant  value  in  the Line-width-Register. out, and what was left was trying to distort the picture using offset  register. for  the NOP,  to modify  the HScroll-Register  while the  screen was  scanned. machine! The effect was working, I just had to let it run and drink some beers. every 16 pixels, allowing  us to display a  plasma while distorting the  screen. artwork, a sweet music and it will be visible by everyone! 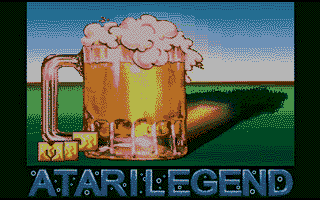 will be used as an intro for Atari Legend, or better for a CD from them.